Chrome handlebar control kit is for single disc application. 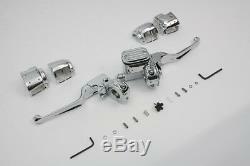 It includes 9/16 bore master cylinder clutch handle with clamp and two pair of chrome switch housings. Unit Of Measure: 1 - EA. Style: Stock 2017 Catalog pages: 1046, 1048. 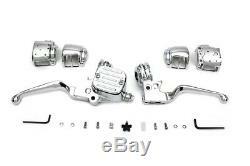 The item "Chrome Handlebar Control Kit fits Harley Davidson, V-Twin 22-0877" is in sale since Wednesday, February 1, 2017.